The World Bank Group has issued a guarantee for a US$1.1bn syndicated loan for the huge Trans-Antolian Natural Gas Pipeline (Tanap), which is to transport gas from Azerbaijan to Europe. The 15-year guarantee comes from the World Bank’s insurance arm, the Multilateral Investment Guarantee Agency (Miga), and covers debt from AKA Bank, Citi, Crédit Agricole, ING, LBBW, Santander and Société Générale. The giant pipeline is expected to pump 16 billion cubic metres of natural gas to Europe each year, from the Shah Deniz 2 gas field in Azerbaijan – one of the world’s largest gas fields. Tanap travels through Georgia, Turkey and Greece to Italy. It is viewed as a means of diversifying the EU’s gas supply away from Russian sources, following political and economic tensions between the pair. The pipeline was inaugurated in June and made its first gas deliveries at the end of that month, when commercial gas was delivered to Turkey. The 1,850km pipeline is one of the sections of the Southern Gas Corridor (SGC), which has a combined cost of around US$45bn. The general director of the SGC, Afgan Isayev, says that this is “one of the largest ever guarantees provided by Miga” and the first ever deal between Miga and Azerbaijan. 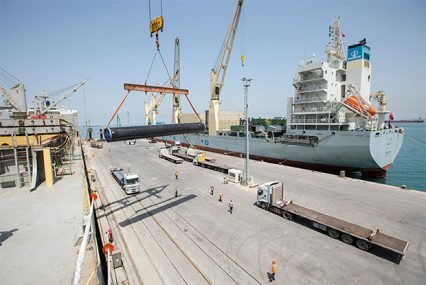 Another section, the Trans-Adriatic Pipeline (TAP), has also received further debt funding, in the form of a direct loan from the European Bank for Reconstruction and Development (EBRD). TAP also transports gas from Shah Deniz 2, via Greece, Albania and Italy. At its end point, it connects with the Italian gas network, and from there with wider European networks. It constitutes the final leg of the SGC and has an initial capacity of 10bn cubic metres per year. Total project cost for this portion is €4.5bn, with much of the finance coming from development banks and export credit agencies. In February 2018, the European Investment Bank approved a €1.5bn loan for the TAP, saying that it would help offset declining European production and displace coal-fired plant generated energy. In March, the EIB also agreed a €932mn loan for the Tanap section of the project. This followed a loan of US$500mn made by the EBRD to Tanap in 2017. The Asian Infrastructure Investment Bank (AIIB) approved a US$600mn loan to be used in the Tanap project’s construction late-2016, while the World Bank pledged US$800mn at the same time. In May 2017, the Asian Development Bank (ADB) lent US$500mn to the SGC, having previously being involved in a US$1bn syndicated loan to the project in 2015. However, banks have been criticised for ignoring human rights and climate change concerns pertaining to these mega-projects. A study by Bankwatch shows that the pipeline’s climate footprint would be comparable to that of coal, or even worse, due to the release of fugitive methane and the burning of gas. The NGO also raises concerns that by releasing funds to the various SGC projects, European lenders are ignoring the “increasingly authoritarian regimes in both Turkey and Azerbaijan”. While the EU views the SGC as a vital source of new gas supplies after the sanctioning of Russia following its invasion of the Crimea in 2014, the bloc has been criticised for increasing its dependence on Russian exports in recent years. US President Donald Trump, addressing the NATO Summit this week, accused Germany of being “captive to Russia because it’s getting so much of its energy from Russia”. Germany, ostensibly a NATO ally of the US, is the world’s largest importer of natural gas and nearly half of its supply comes from Russia. German chancellor Angela Merkel denied the accusation, saying: “I have experienced myself how a part of Germany was controlled by the Soviet Union.” Germans “can make our own policies and make our own decisions”, she added.